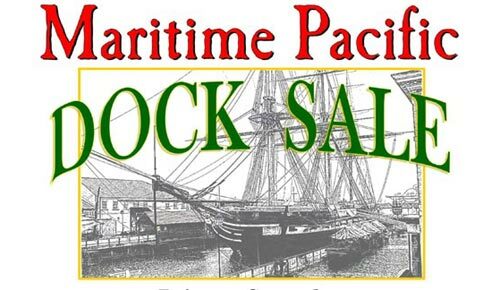 On Saturday, April 14th from 12:00 – 4:00, Maritime Pacific Brewing in Ballard presents its 8th Annual Dock Sale and Hawaiian Barbecue. This is an opportunity to pick get a screamin’ deal on some Maritime Pacific beers and also chow down on some tasty Hawaiian grub. Join us for our 8th Annual Spring Dock Sale and Hawaiian BBQ Special! Drink away those Friday the 13th troubles. 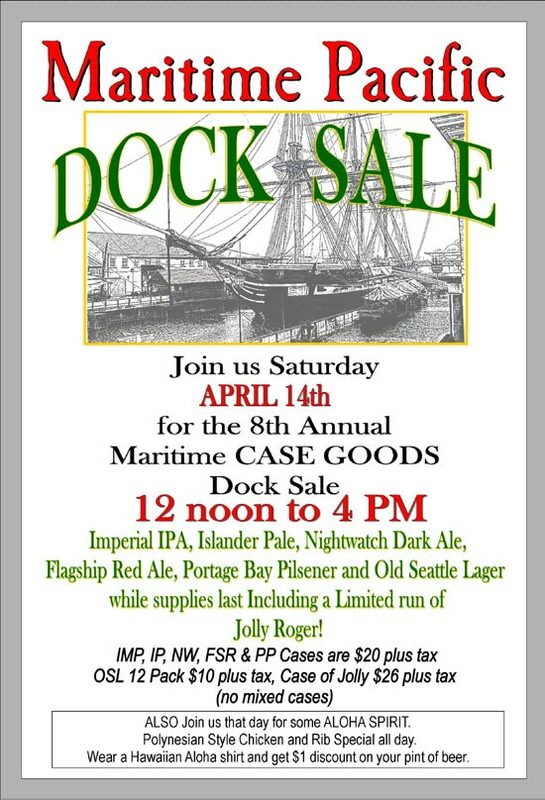 Join us for Maritime’s 8th Annual Spring Case Goods Dock Sale on Saturday, April 14th from Noon to 4PM. Pick up some cases of your favorite Maritime Pacific beer for ridiculously low prices. Islander Pale Ale, Flagship Red Ale, Nightwatch Dark Ale, Portage Bay Pilsener, Old Seattle Lager and, of course, our Jolly Roger Christmas Ale, will all be available. Just come to the open Brewery Bay Door Saturday April 14th at 1111 NW Ballard Way from Noon to 4 pm and we’ll make you happy and even help you load it into your vehicle if you want. We’re also serving up some Aloha spirit all day with this year’s Dock Sale. A Special Hawaiian BBQ Chicken and Rib plate will be available in the Taproom all day, and if that’s not enough, wear a Hawaiian shirt and we’ll give you $1 off your pint of beer that’s accompanying that delicious plate of food. Or just come by for a pint and we’ll still give you a $1off if you’re wearing a Hawaiian Shirt. A Big “Mahalo” from the Staff at Maritime.